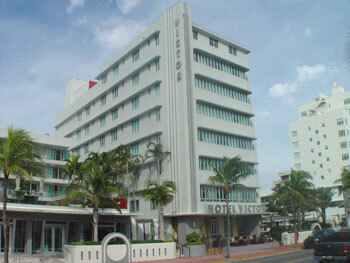 Miami Beach 411 > Hotels > 4-star > Victor Hotel in Miami Beach, FL. ¿Hablas Español? ABOVE: The people who won a free trip to the Victor Hotel. Watch more hotel videos. This page allows you to watch a video, find directions, post a comment, read reviews, and check rates at the Victor Hotel. Rates: Low season from $350. High season from $475. Internationally-renowned, Paris-based Decorator Jacques Garcia has brought to life an ultra-luxurious, 91 room retreat with a glamorous look and tropical ambience. Wireless Internet access (Wi-Fi connections) is available throughout the hotel. • Wide-screen plasma and TVs, DVD & CD players with surround sound. Click HERE for Victor Lodging Information. • Continue East on 5th Street 8 blocks to Ocean Dr..
• Turn Left (North) on Ocean Dr..
• The Victor is on the Left (West) side of the street. The Victor is located at 1144 Ocean Dr., Miami Beach, FL 33139. Use our Miami hotel map to find the exact location. Victor Hotel in Miami Beach. Miami hotel reservations.